2Lt Maurice C. Daum (P) - Dispatched on first eight missions as 1st Pilot, then twelve missions as a CoPilot with six different Pilots, then ten missions as 1st Pilot with no assigned crew. Combat tour completed on 20 June 1944. 2Lt Donald L. Gibbons (CP) - Dispatched on Five missions with Lt Daum (134(A),140(A), 143, 144, 145) then with five missions with the Lt Ernest L. Roth crew (148, 148, 151, 154, 155). Became a POW on mission #155, 19 May 1944 to Berlin, Germany, in B-17G 42-31386 Sky Duster (359BS) BN-W, Lt Roth (P). Hit by flak just before bombs away knocking off one engine. B-17 slipped to the right out of the formation . Six crew KIA and four POWs. 1Lt Frank F. Forve (N) - Dispatched on all of the Lt Daum first eight missions as Pilot. Flew on 26 additional missions - last 16 as a PFF Lead Crew Navigator. Combat tour completed on 23 June 1944. Volunteered for a second mission. Thirty-fourth and last mission on 17 April 1945. 2Lt Terril M. Grove (B) - Dispatched on seven Lt Daum missions (134(A), 136, 137, 140(A), 143, 144, 145). Substitute Togglier used on mission #138. 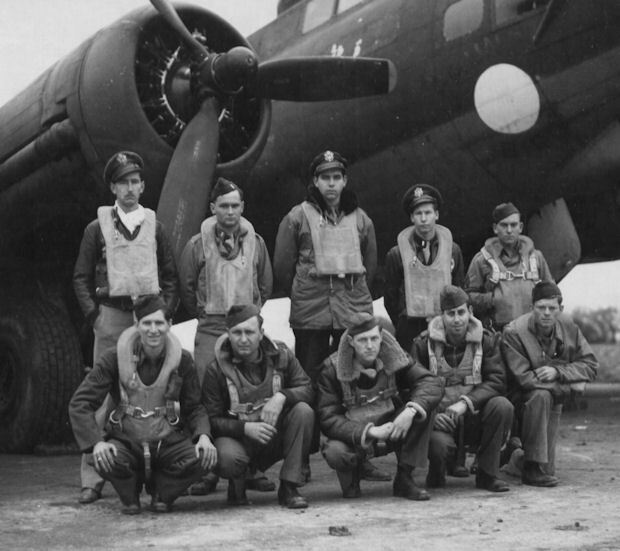 Became Bombardier on the 1Lt John W. Tulloss Crew for 15 missions. Combat tour completed on 19 June 1944. T/Sgt Fred T. Matthews (E) - Dispatched on seven Lt Daum missions (134(A), 136, 137, 140(A), 143, 144, 145). Substitute Engineer used on mission #138. Additional missions: Four with Lt George R. Sirany (P) and six with Lt Maurice C. Daum (P). Combat tour completed 20 June 1944. T/Sgt William C. McLaughlin (R) - Dispatched on six Lt Daum missions (136, 137, 140(A), 143, 144, 145). 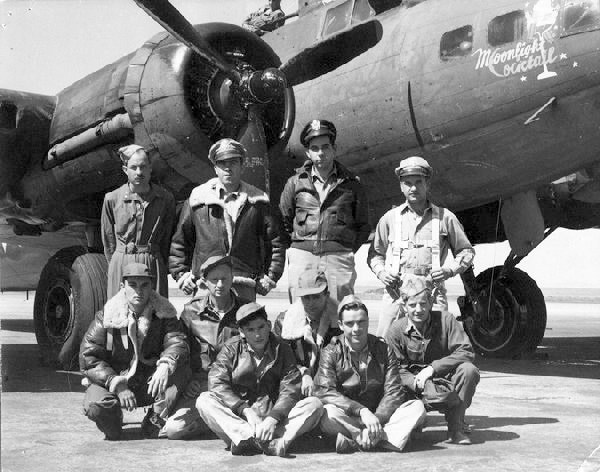 Additional missions: Twelve with 1Lt David E. Fackler (P); Eight with three other Pilots. Combat tour completed on 18 July 1944. S/Sgt Crawford E. Jenkins (BTG) - Dispatched on all of Lt Daum's first eight missions as Pilot. Additional missions: One with Capt Lawrence C. Thompson; Twelve with 1Lt John W. Tulloss. Combat tour completed on 4 June 1944. S/Sgt Dale A. Sampson (WG) - Dispatched on all of Lt Daum's first eight missions as Pilot. Flew on no additional missions. S/Sgt Lee W. Frederick (WG) - Dispatched on all of Lt Daum's first eight missions as Pilot. Additional missions: Fourteen missions with eleven different Pilots. Last eleven missions as a crew photographer. Last mission on 25 Aug 1944. S/Sgt Burt W. Taylor (TG) - Dispatched on all of Lt Daum's first eight missions as Pilot. Additional missions: Six with 1Lt Kenneth C. Edwards (P). Last mission on 12 June 44.